Let me tell you a story about how great my sister is. Last winter, in the depths of a despair-filled Reading Period, my sister sent me a present. 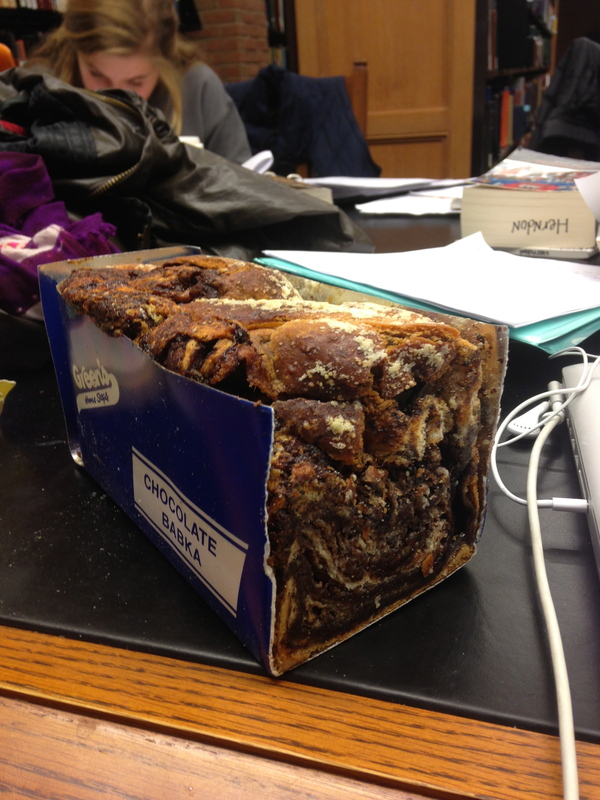 She overnighted me a loaf of Green’s Chocolate Babka from Zabar’s in New York. I was over-the-moon ecstatic. I think I even shed a tear of joy. 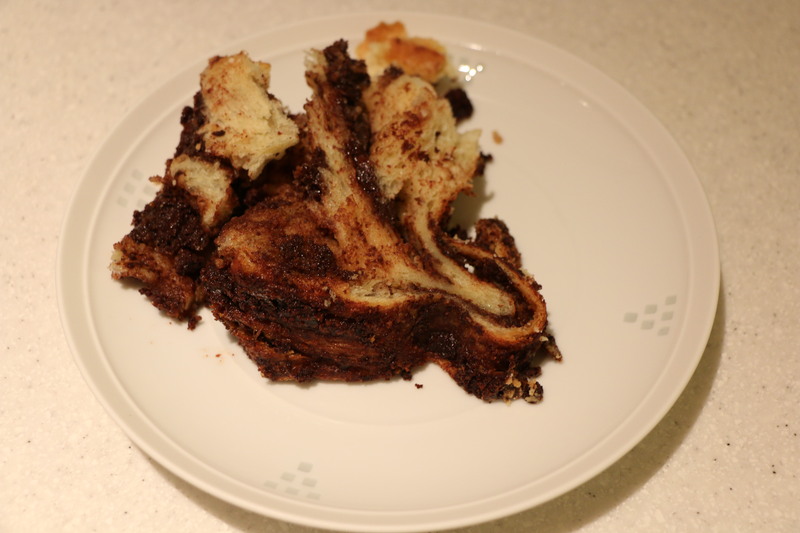 I had been waiting to have a slice of chocolate babka for almost half a year. To understand my relationship with babka I have to backtrack a year. Last summer I became obsessed with finding and trying babka. I had about one week left in San Francisco, and I went everywhere looking for it. Babka, apparently, is rare in San Francisco. Or worse, doesn’t even exist. My last hope was Wise Sons Delicatessen, but when I made my excursion out to the Mission the establishment was unfortunately closed. Alas, I left San Francisco unsuccessful and unfulfilled with my quest. 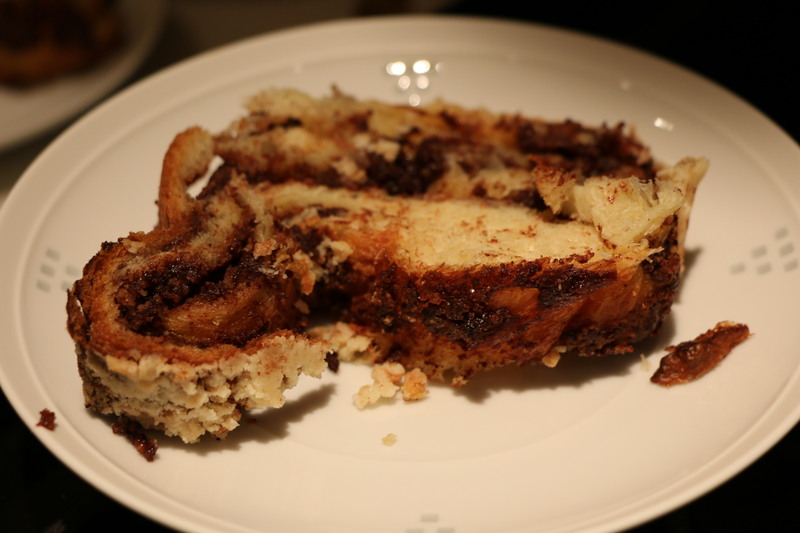 My experiences with babka since then have always been fantastic, delicious, chocolate-y goodness. 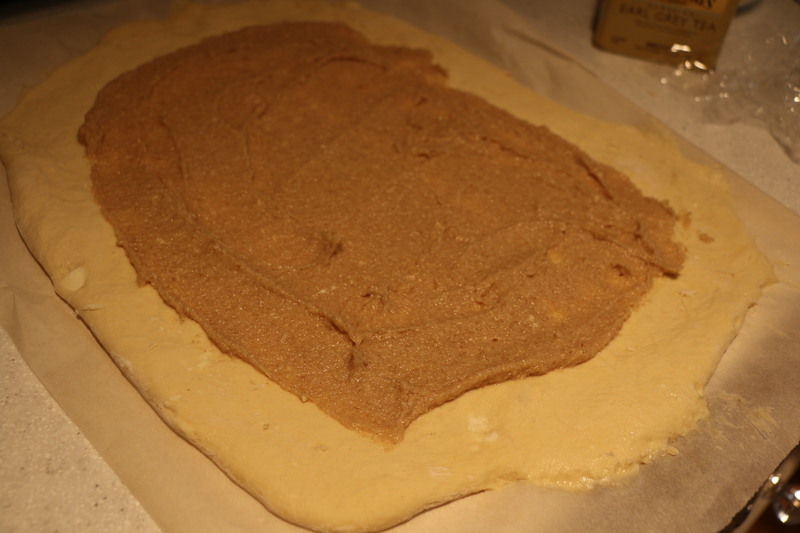 This summer, I decided to try my own hand at making babka. 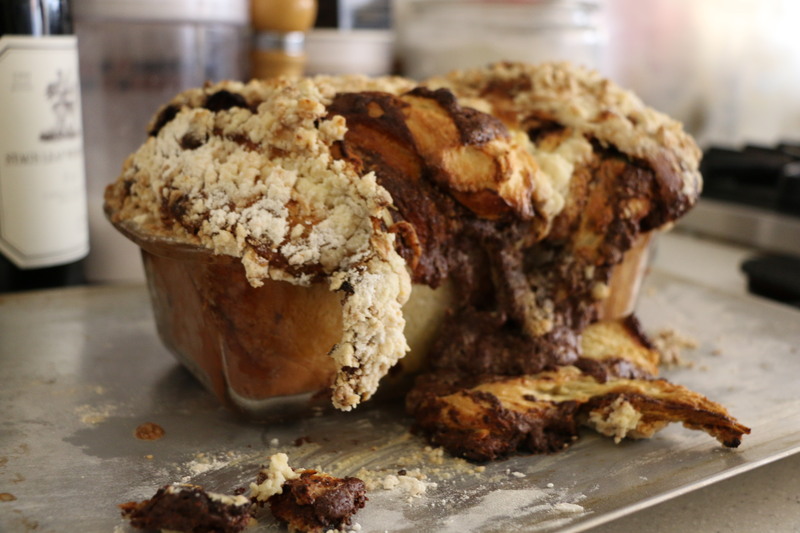 I used the food network’s recipe online because it seemed to go along best with my favorite parts about babka – rich, chocolate-y, with streusel on top. You can find the recipe here. A beautiful, overflowing mess. Mmm. The restaurant is quite formal. Jacket is requried, and they refer to themselves as a “special occasion restaurant.” I was worried about taking photos inside, but was assured that it would only be a problem if I was distracting other diners. Given that the table next to us was a large, loud table yelling in Cantonese, I had no problem pulling out my camera for a few quick snaps. Snake River Farms beef tartare, onion soubise, white celery, and Balsamic pearl onions Cuttlefish ‘tagliatelle’ with capers, chili flakes, lobster,and agretti Smoked potato gnocchi with prosciutto, confited summer truffle, chive,and Parmesan Acquerello risotto with Brentwood corn, Tiger prawns, pancetta,and Calabrian chili Grimaud Farms air chilled duck breast, beets, black pepper crumb, hibiscus and blackberries Maine lobster tail with smoked butter, Brentwood corn custard, confit tomato,and tarragon Bourbon-caramel semifreddo, Amaretti crust, chocolate, and caramel sauce Complimentary desserts to finish off our meal. And a box of biscotti to take home. The biscotti were beyond delicious – quite different and wetter in texture than those I am used to (like my dad’s famous biscotti). 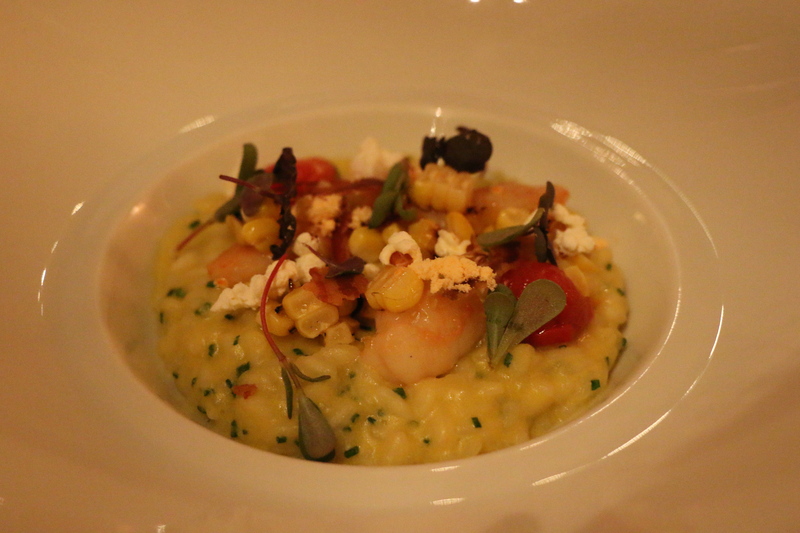 Overall, Acquerello was a fine dining experience. 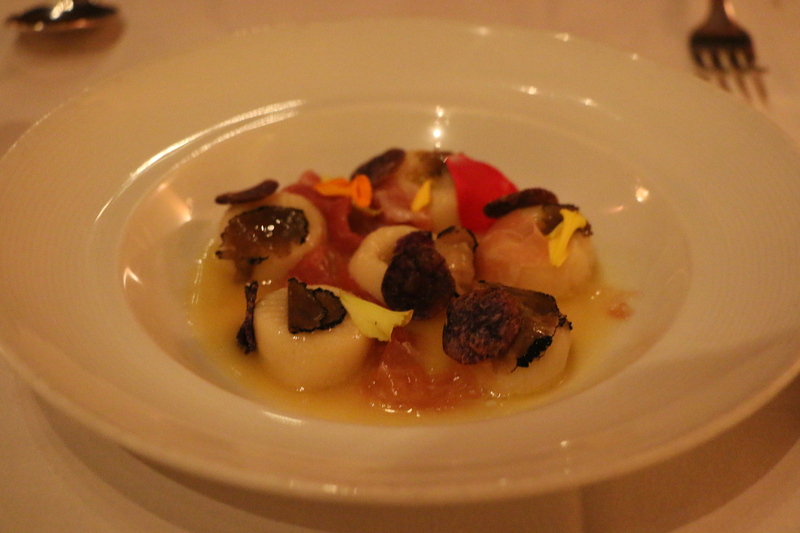 Every dish we had incorporated new flavors and was prepared to perfection. Surprisingly, I found the complimentary dishes to be more exciting and well-prepared than some of the dishes ordered from the menu. 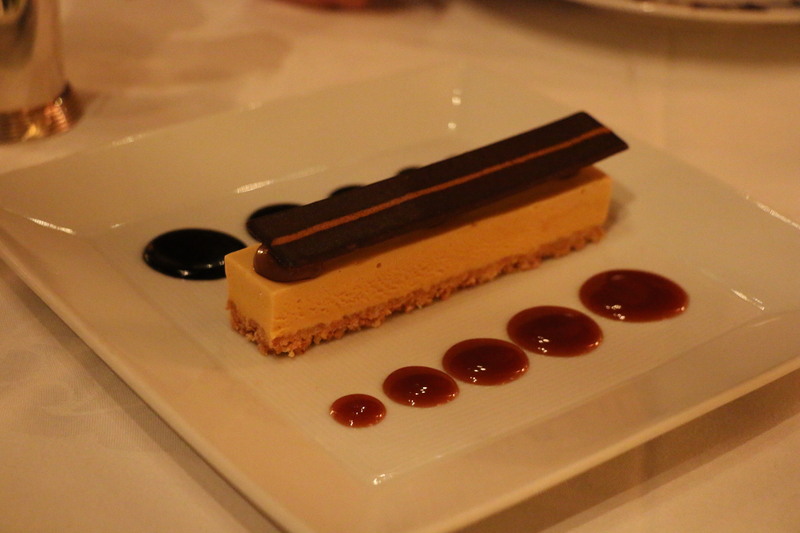 Contrary to some previous reports on Acquerello, we also found our dessert to be delightful. 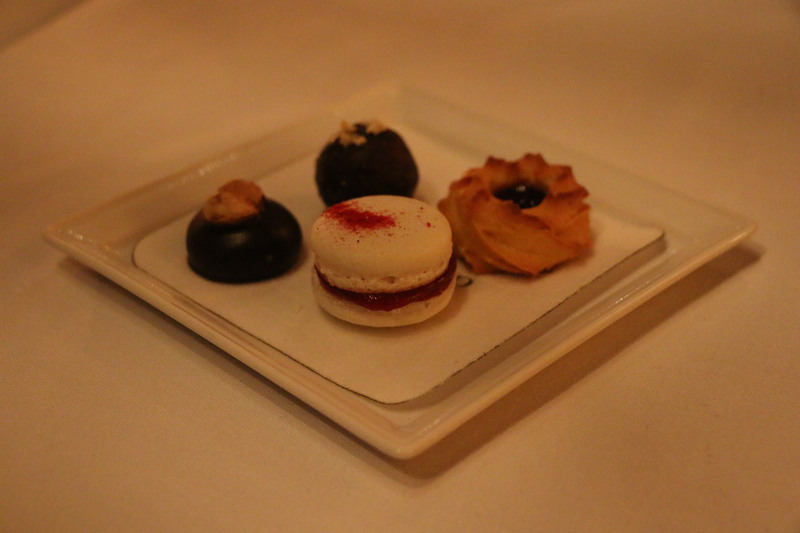 We were hesitant to order any dessert, given how full we were, but we were pleasantly surprised by the quality of pastry. Acquerello was an experience I would do over again no question, as long as I am not the one paying. Outside Lands is a three-day festival in San Francisco’s Golden Gate Park causing a mass invasion of festival-goers, policemen, music-lovers, and food trucks and stalls. 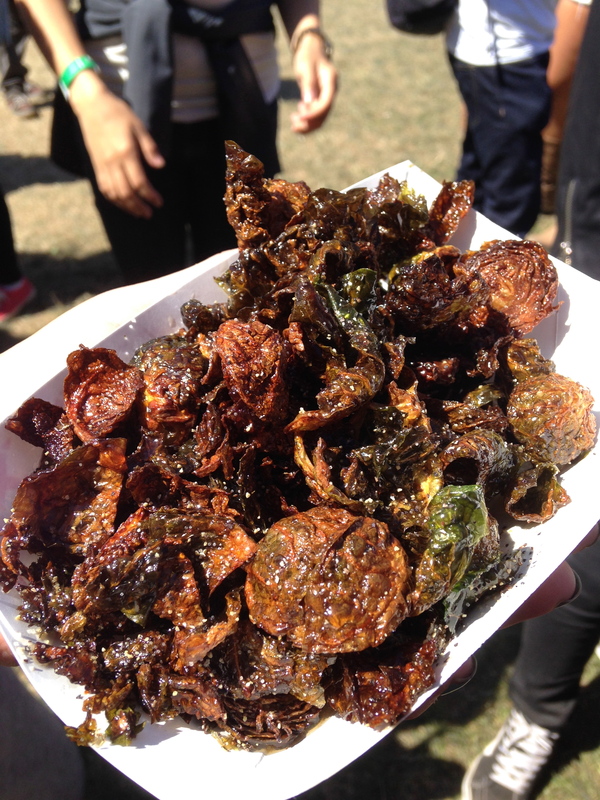 As my friend GP pointed out, Outside Lands is not just a festival of music but a festival of music and art – and the art of food most definitely plays a significant part. Apparently there were more than 2000 “food items” at the festival, though we couldn’t quite decide what counts as a separate food item. The three-day weekend was a great way to get in all of my SF/American food fixes after China and before I leave for school again. 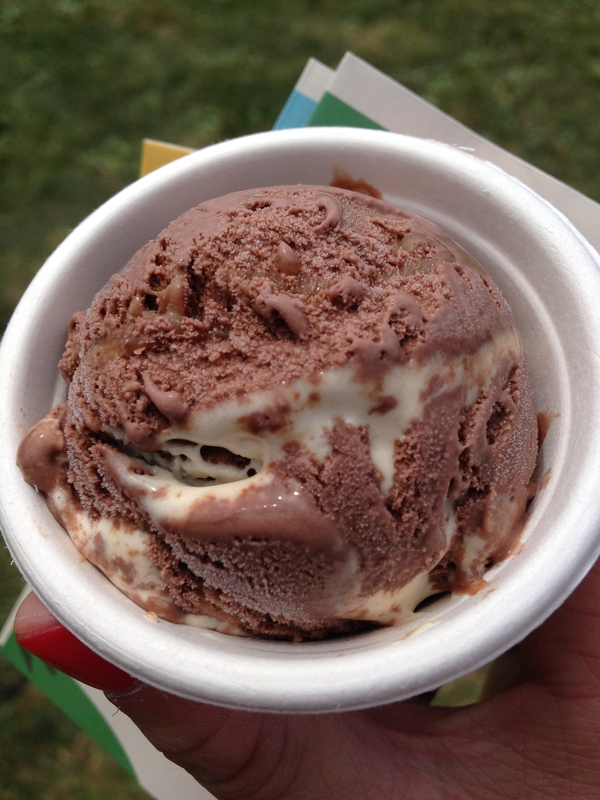 And so it goes… What better way to start out the weekend than with free Ben & Jerry’s Phish Food? 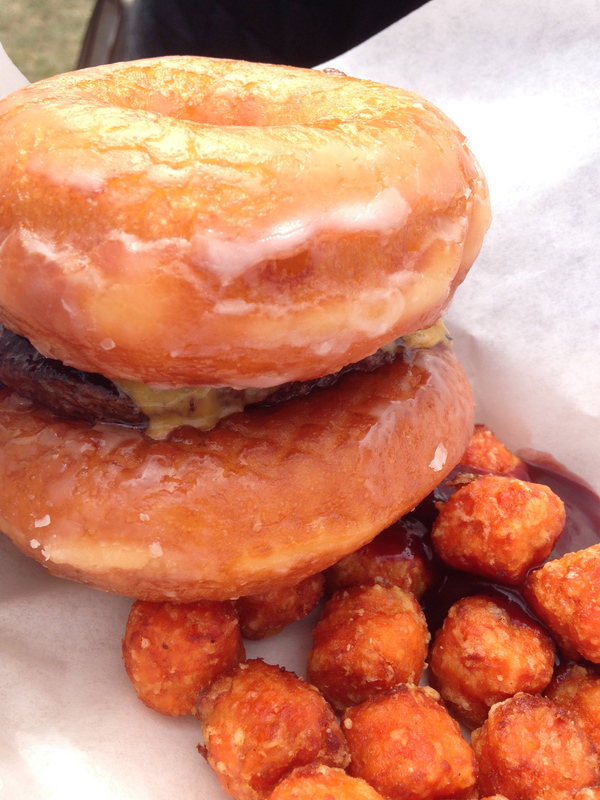 Straw’s Donut Cheeseburger. I did not eat this entire thing – just one bite – which was enough to 1) make me realize that it actually was quite tasty and 2) clog 50% of one of my arteries. Namu’s Korean Quesadilla. Nice idea, poor execution (granted, they were working with minimal space). 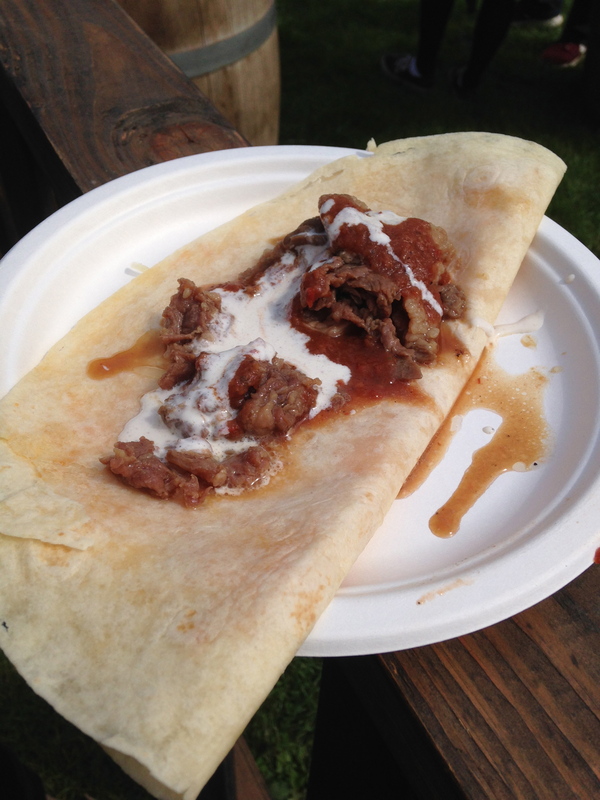 The cheese was not fully melted, which is always a game-changer in a quesadilla. 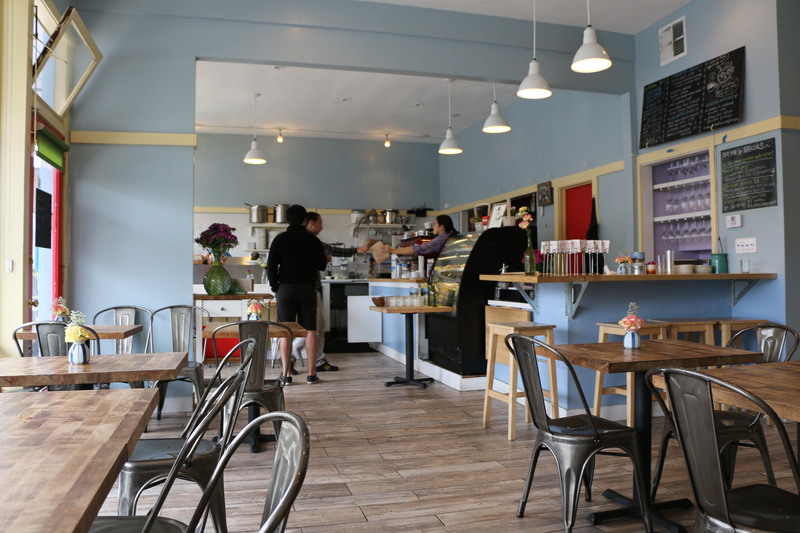 Suite Foods Waffle Shop. 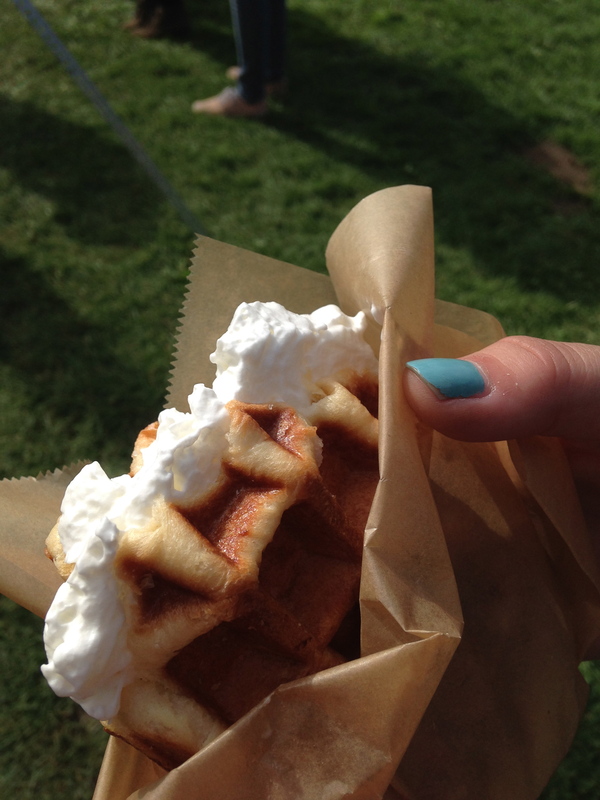 We searched everywhere for these waffles which were featured on The Bold Italic’s Must Eats at Outside Lands. We finally found their small cart. Waffles were great. 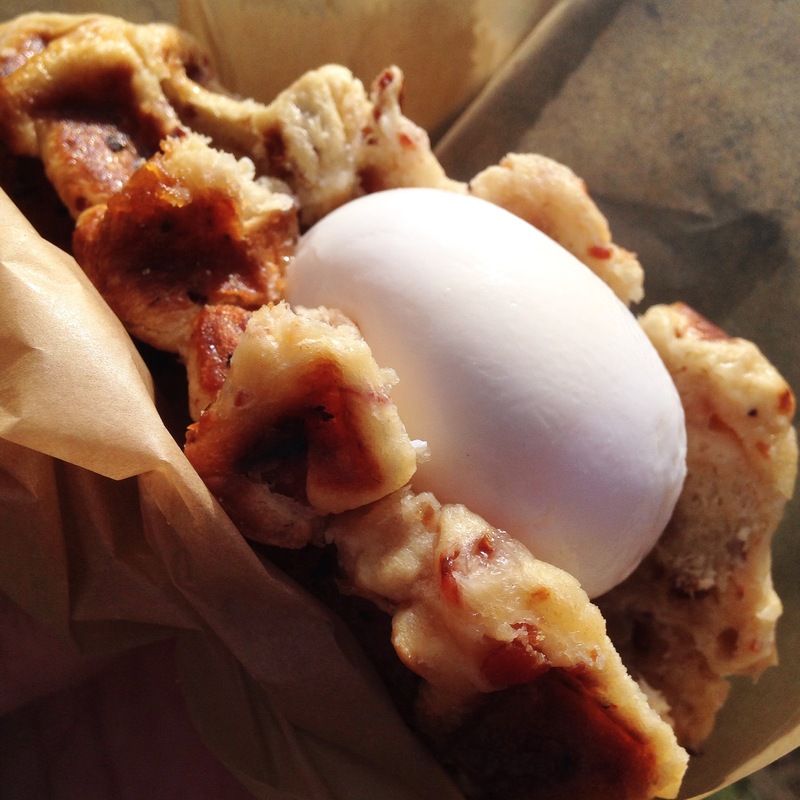 Suite Foods Waffle Shop’s Maple Liège Waffle with Poached Egg and Smoked Sea Salt. The one major problem with this waffle was that a good poached egg to waffle distribution was quite difficult, maybe impossible, given the differences in their sizes and shapes. 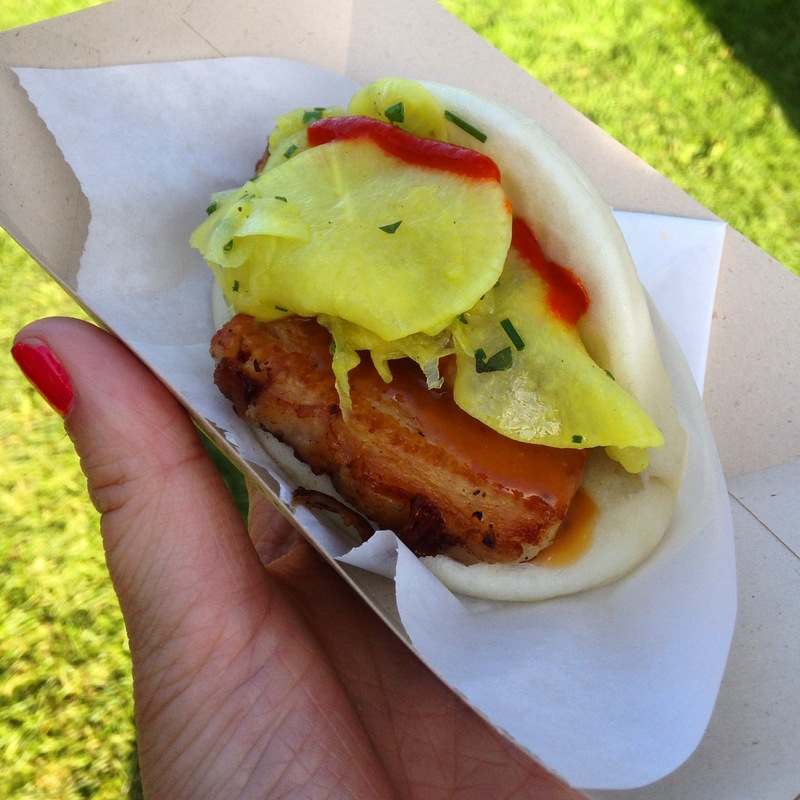 The Chairman Truck’s Steamed Bun with Pork Belly, Tumeric Pickled Daikon, and Shiso. I have had hundreds (okay, maybe not hundreds but up there) of Chairman Bao’s buns and loved them every single time. It is my favorite food truck in San Francisco. I had to get one for my visiting friend Alicia so that she would also love San Francisco. 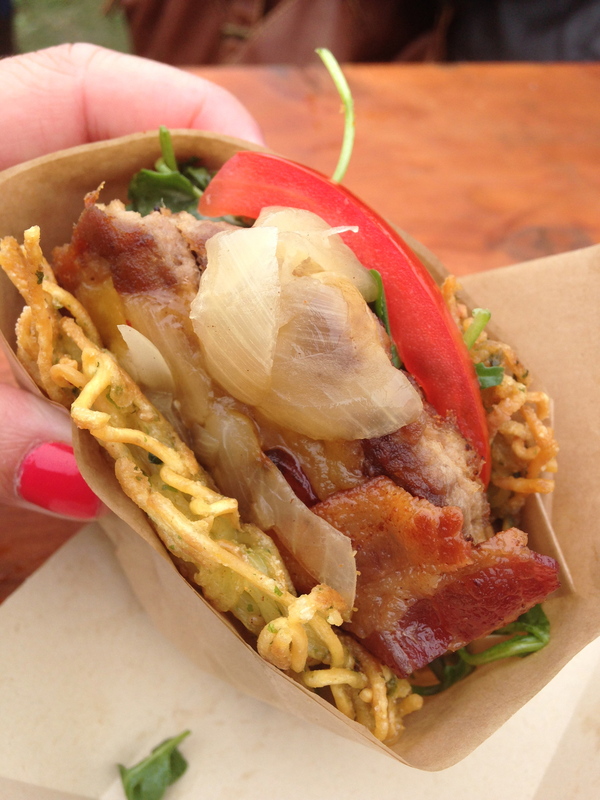 Nombe’s Ramenburger. The line was incredibly long for these ramenburgers every single day of the festival. Our ramenburger was sub-par. The actual burger was dry, and, well, I have very strong feelings about overcooked meat. Rich Table’s Dried Porcini Doughnuts with Raclette. No visible Porcini in these doughnuts, but the rich flavor of the mushrooms was there. The raclette was incredible fluffy and delicious. Awesome. Il Cane Rosso’s Griddled French Toast. Best French Toast I’ve Ever Had. That’s saying a lot. 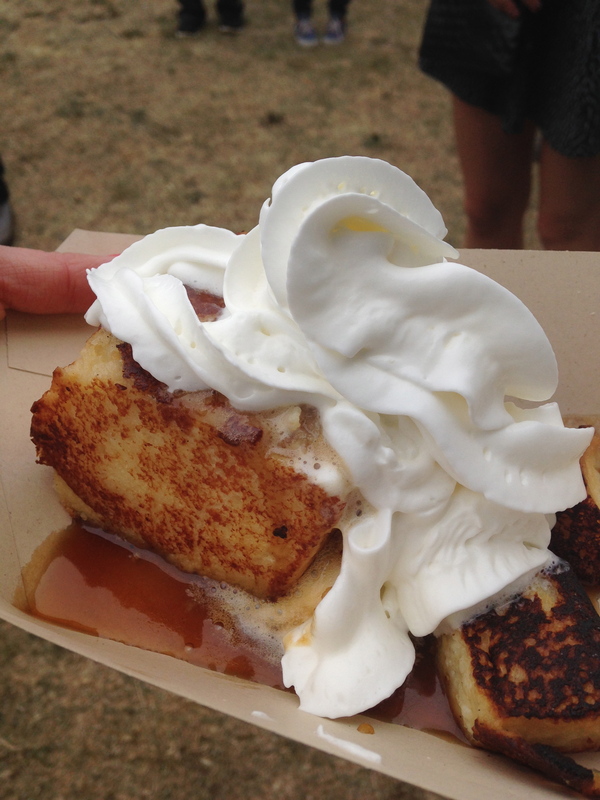 It was really more like a huge chunk of rich bread pudding with maple syrup and whip cream. To. die. for. But actually, I might consider an earlier death by morbid obesity because of this dish. 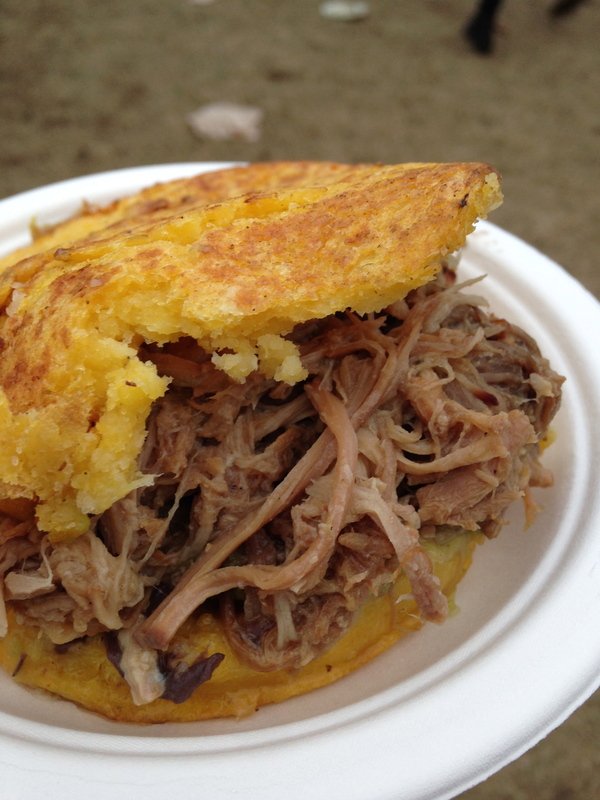 Pork Arepa from Pica Pica. Always solid. 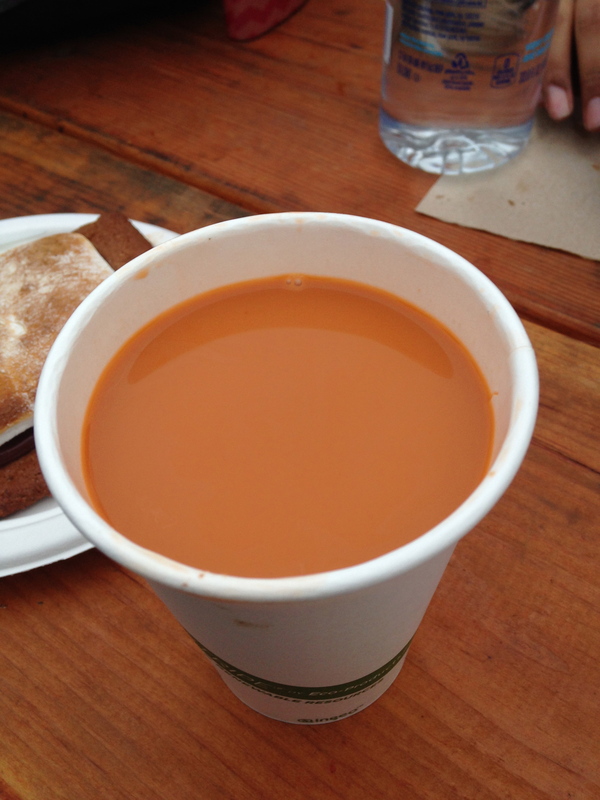 Hot Thai Tea from Charles Chocolates. 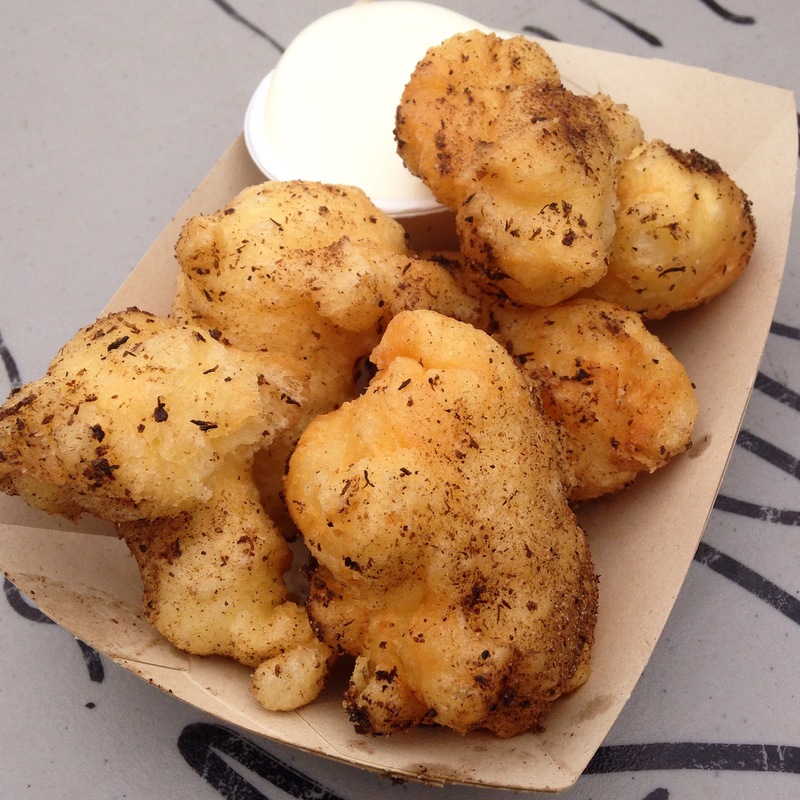 American Grilled Cheese Kitchen’s Crispy-Sweet Maple Brussel Sprouts. Bomb. 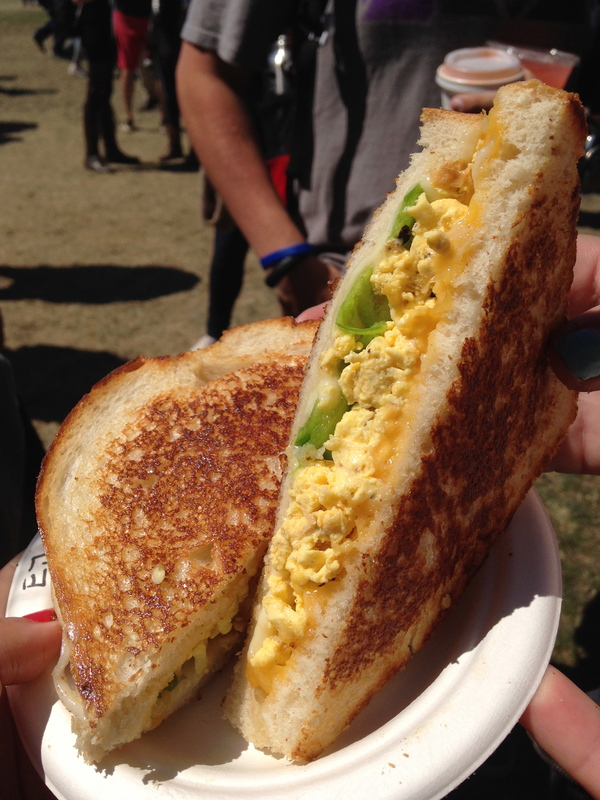 American Grilled Cheese Kitchen with Eggs and Green Chiles. 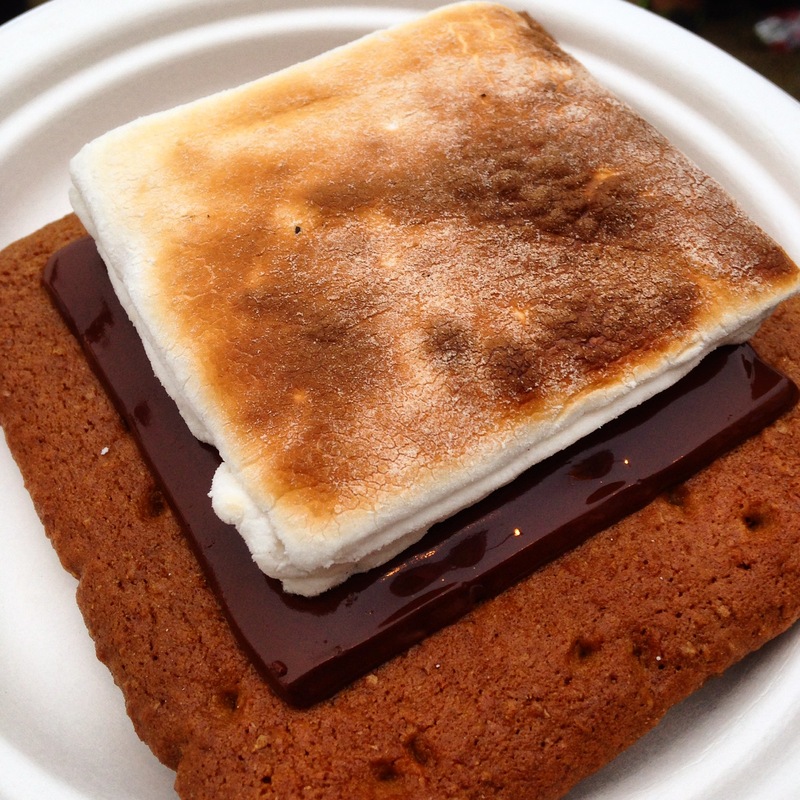 Sharona’s Chocolate Shop S’more. 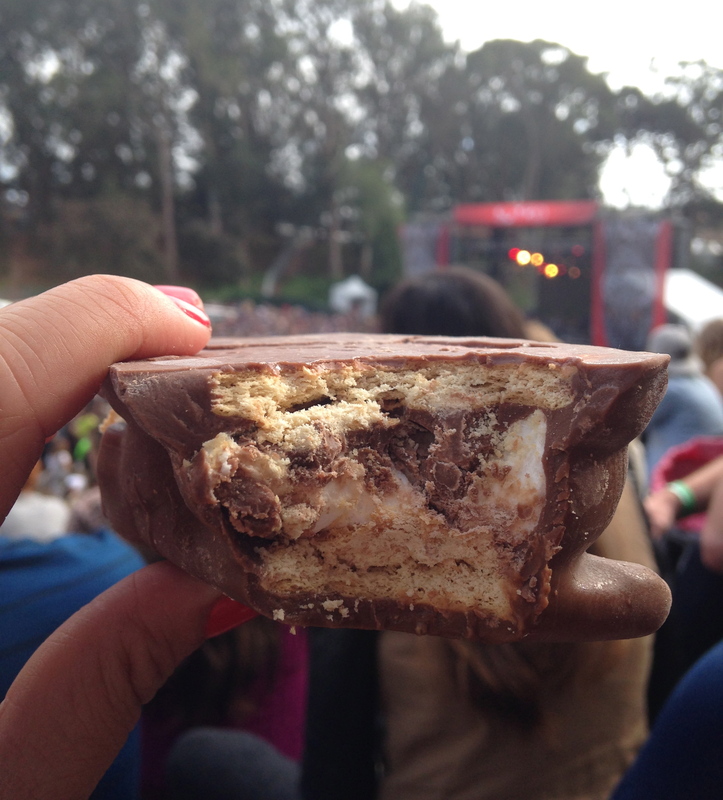 I was watching Ben Howard, it was National S’mores Day, it was free, it was in front of me. Can’t go wrong. Sataysfied’s mik tek tek fried noodles and dumplings. The noodles tasted like Cup Noodles. Not worth it. A HUGE shout-out to my main eating partner, Alicia. She tried to get in most of the food photos. Alicia is the Waldo of Where’s Waldo: The Lowe Down Version. By the way – we did listen to music, too. Until next year, Outside Lands. 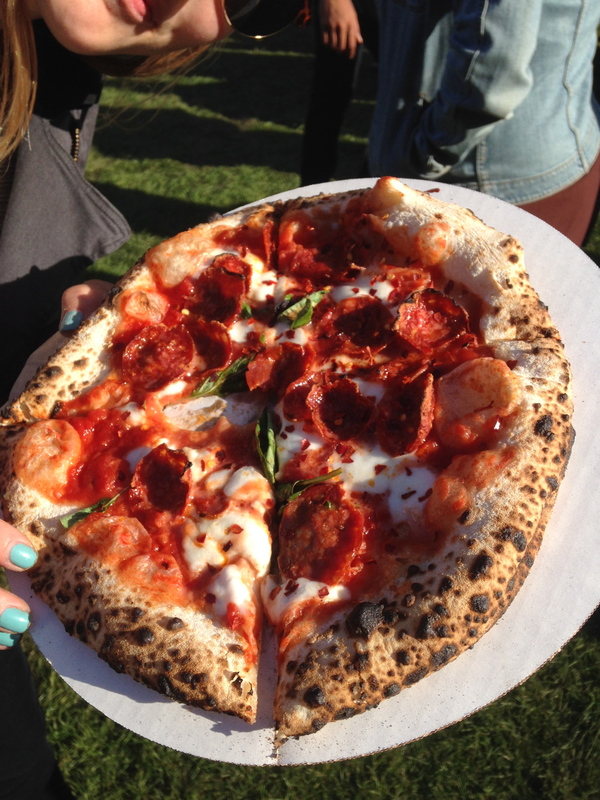 Follow us on Instagram @thelowe_down for delectable photos!! 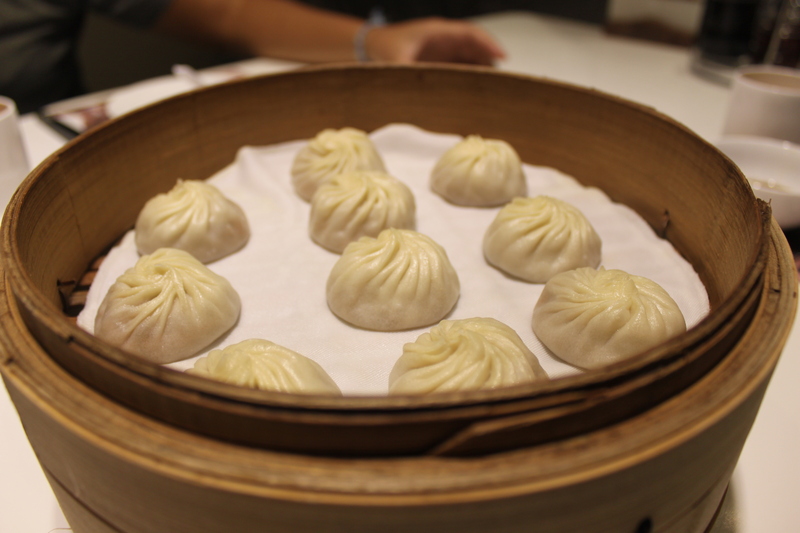 Din Tai Fung is a Michelin-star awarded international restaurant chain, specializing in soup dumplings or xiaolongbao (as pictured above). My parents have been to one of the two branches in the Los Angeles area, but left unimpressed. 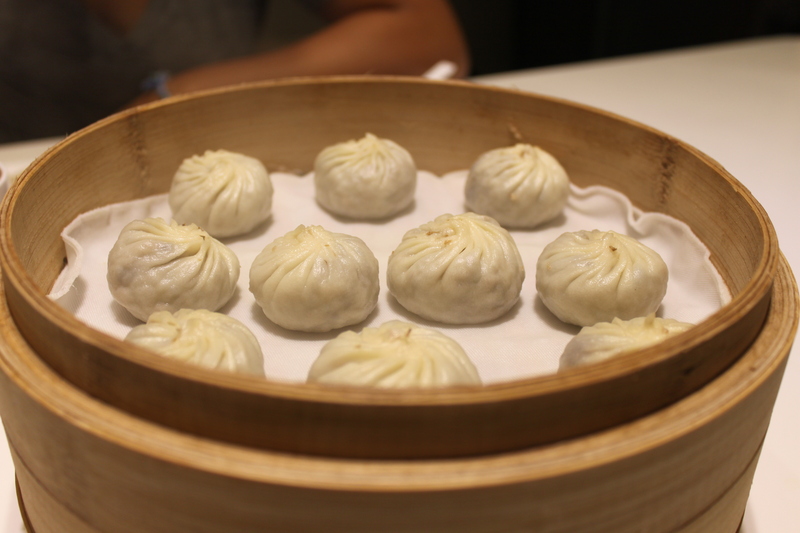 In contrast, I was always impressed with the dumplings at the Din Tai Fung in Beijing. 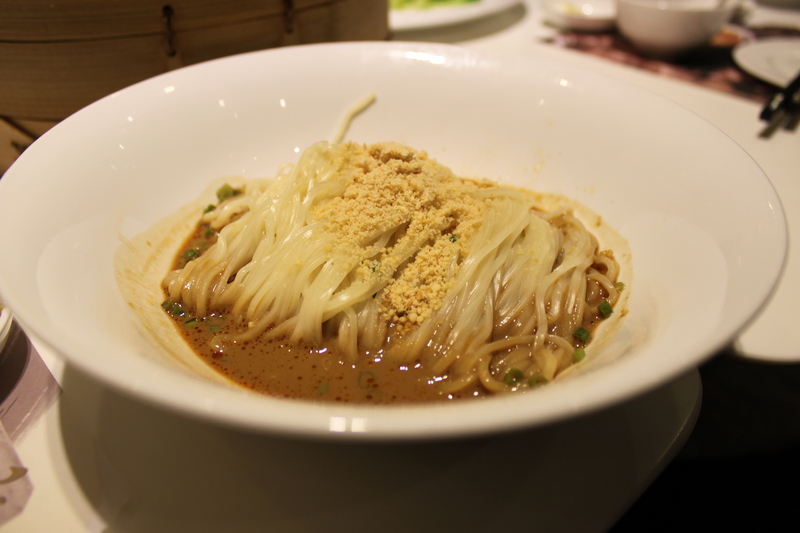 The dumpling skins are extremely thin, and the soup is plentiful and steaming – not burning – hot. 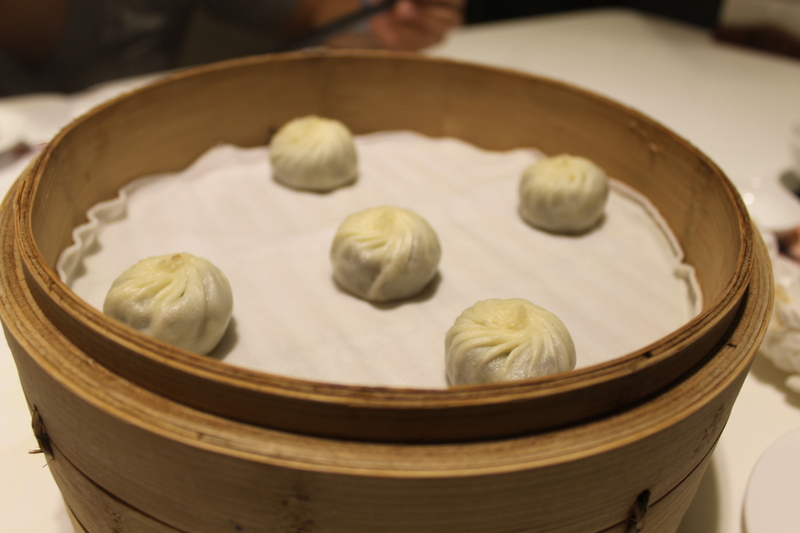 I documented my last visit to Din Tai Fung in Beijing where I shared a meal with my sister and my friend Hannah. 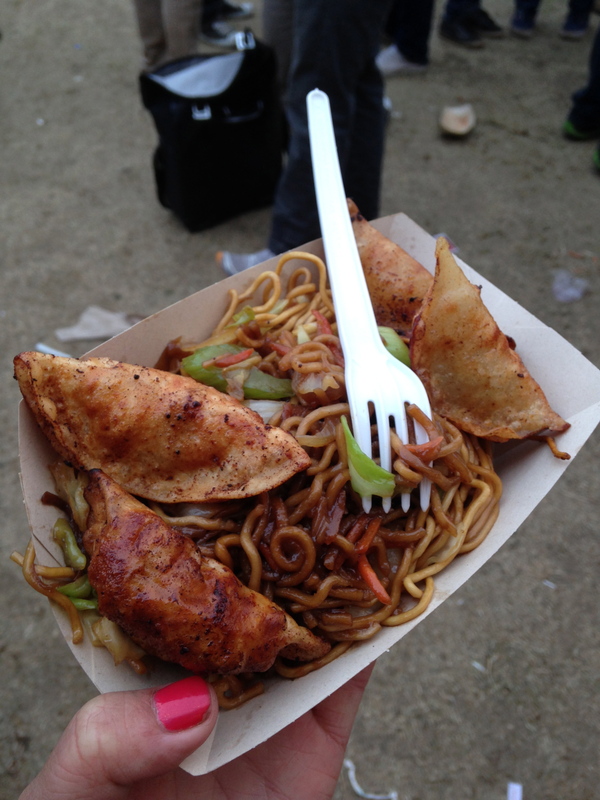 Sesame Noodles – these were bomb. Mushroom Dumplings. It took them about 45 minutes to come out with these dumplings. We were waiting a long time, I’m not sure exactly what happened. 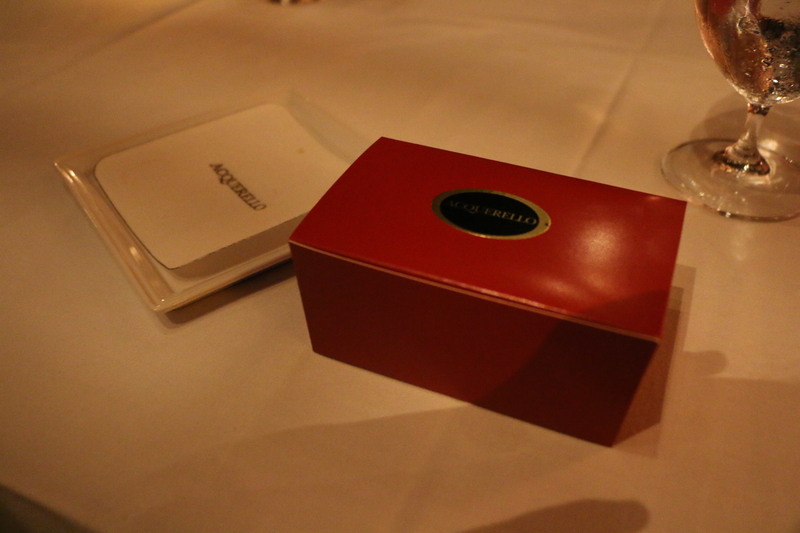 I made a fuss about it and so they gave us complimentary dessert. Red Bean Dumplings. One of my sister’s best friends highly recommends these, but I was always skeptical. I’m not a huge fan of red bean. I was pleasantly surprised. 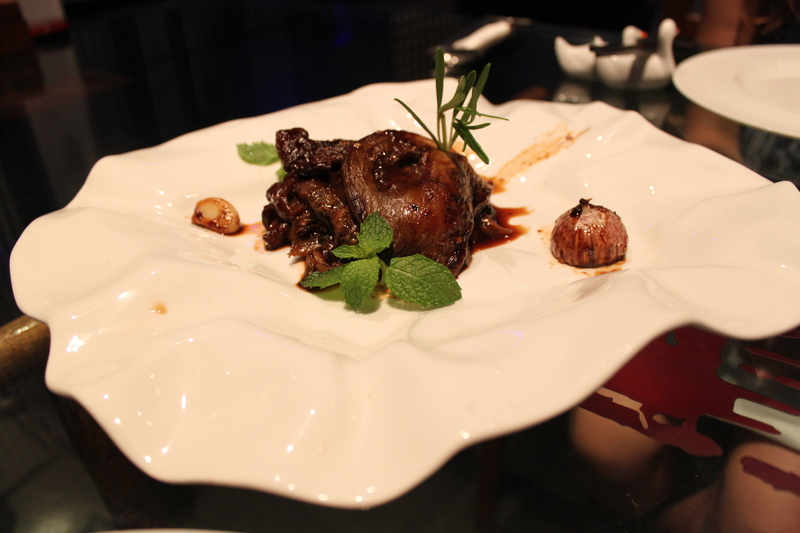 The red bean was obviously very high quality and the dumpling skin was thin and delectable. As a child, I was notoriously picky. My main sources of nutrition were bread, pasta, peanut butter, and duck. While everything else I ate in moderation, I could inhale duck. Duck confit, duck rillette, roasted duck, duck ragu, any kind of duck. Naturally, I am pleased to be in Beijing, where the Peking duck is plentiful. My roommates and I had all planned to go to DaDong Roast Duck as one of our (and perhaps only) large, luxurious dining out experiences in Beijing. 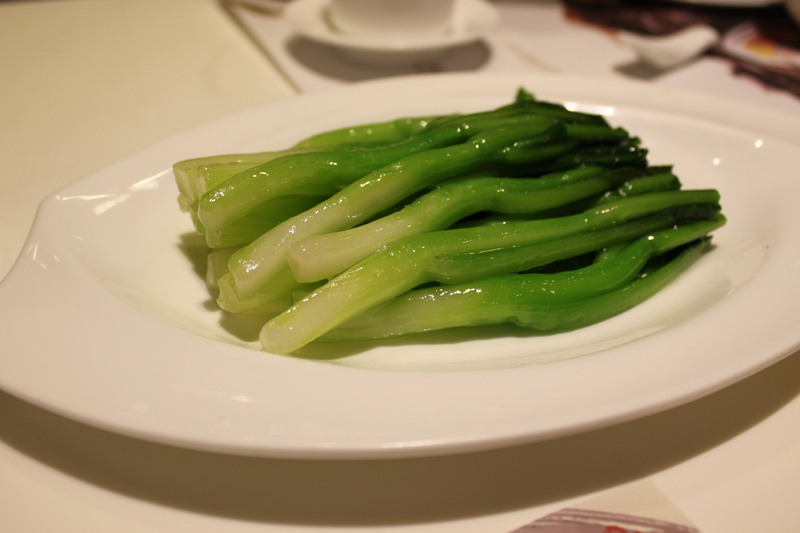 DaDong is known for their lean Peking duck and they have many branches in Beijing. We went to the brand new location next to the Workers’ Stadium. 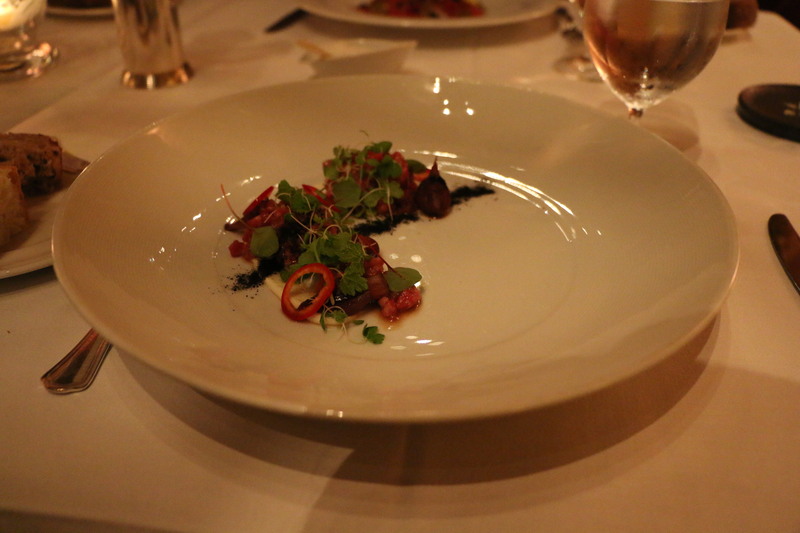 The duck was delicious, the décor extravagantly modern, the dining experience enjoyable, and the price surprisingly not that steep (PianYi!). I should note, however, that I recently had Peking Duck at another less-established, more inexpensive restaurant in Beijing where I found the dishes to be slightly superior to DaDong’s. Stay posted. Braised Eggplant. In China, instead of saying “cheese” when you take photos, people say “QieZi,” meaning eggplant. Sautéed Duck Liver. This was our attempt to be adventurous, exotic, and authentic. 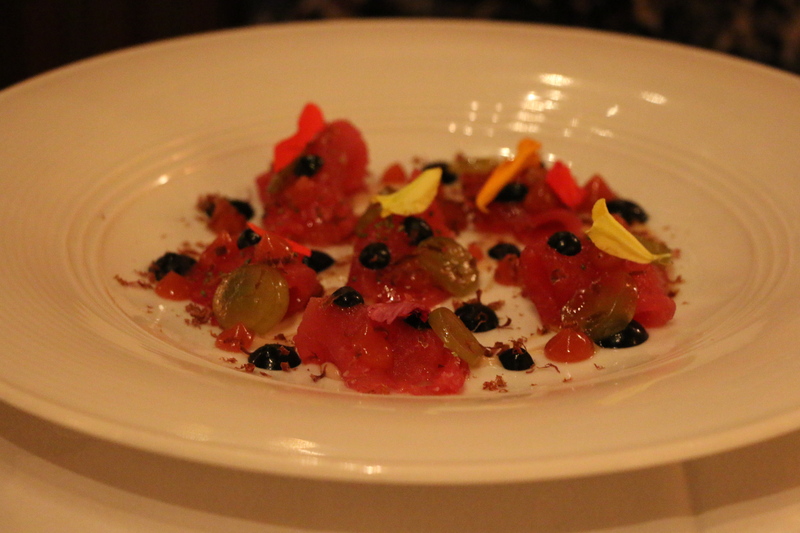 The duck liver was actually good. The musty flavor was at a minimum. My one complaint is that I am pretty sure that the eggplant and duck liver were cooked in the same sauce, which made this part of the meal less exciting and enjoyable. Complimentary duck soup. A flavorful, simple broth. It is said that a DaDong Duck Carver can cut a single duck into 100 pieces. Peking Duck accoutrements – scallions, plum sauce, cucumber, pickles, ginger, sugar, and melon. One of the many assembled pancakes I consumed. The potential combinations are plentiful. Some experimenting was necessary to find my favorite. Complimentary lychees. They pour water into the dry ice below right before they serve it. I am still debating as to whether this has any real effect on the lychees or if it is just for show. 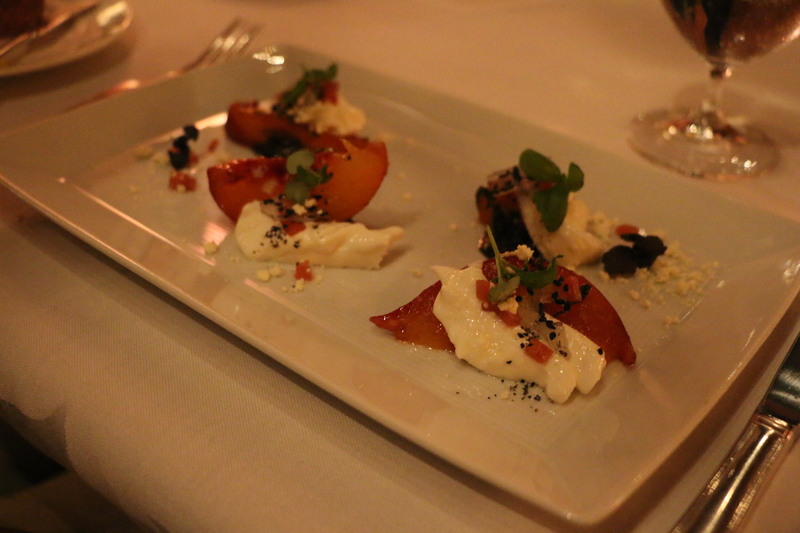 And a complimentary persimmon ice dessert. The wood-like candies on top were delicious ginger candies, and the dessert was topped with burnt sugar. The check came out to be about $35 each for two people (and we ordered for three). I had expected to pay much more. We had a good amount of leftovers that they nicely wrapped up for us to take home. I left pleased. 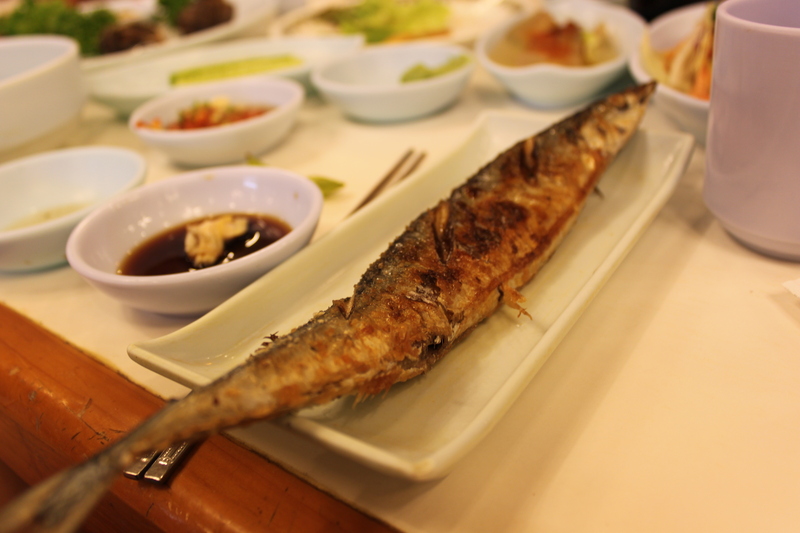 The Noryangjin Fish Market is one of Seoul’s top sites. 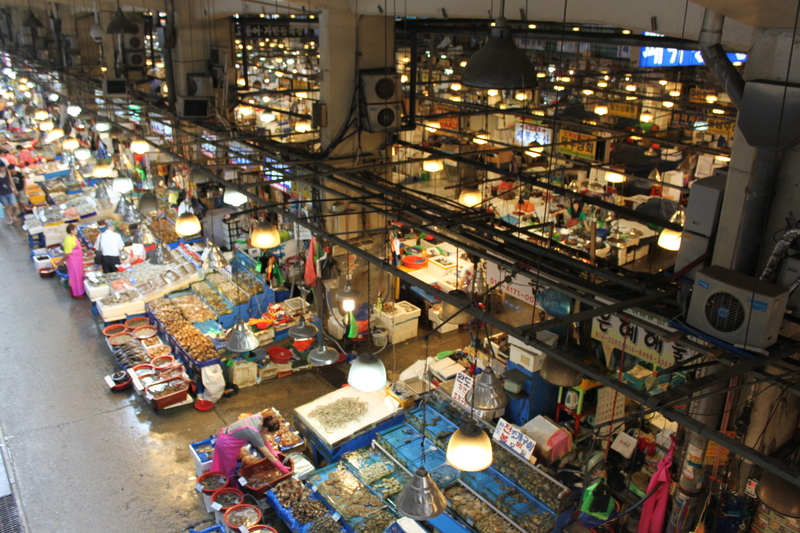 A huge warehouse filled with seafood, the wholesale market attracts locals and tourists alike. 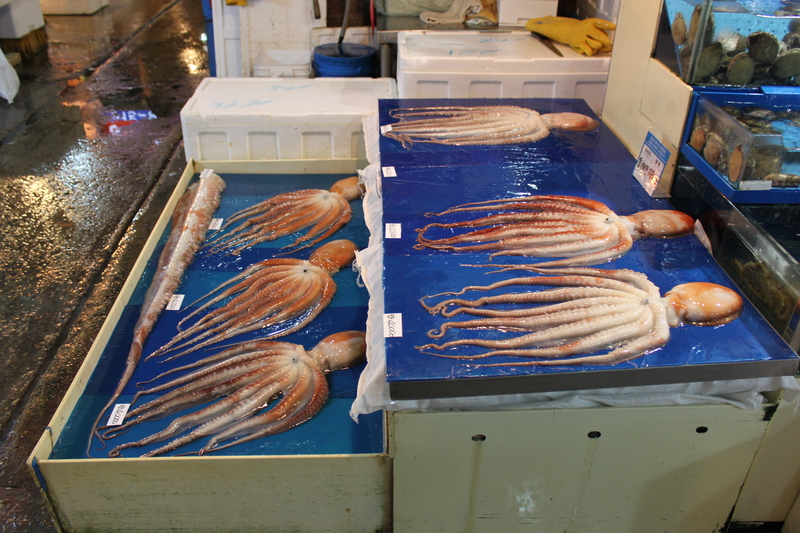 We walked around the market, noting the exotic species available (such as the giant octopi above) and then headed upstairs to one of the restaurants on the second floor. We chose our restaurant based on how many Koreans we saw inside. The easy way to check is to see how many shoes are outside (Koreans take off their shoes before entering a traditional restaurant, where you sit on the ground).We ordered the set menu for two people although we were three. It was definitely the right choice. We were served so many courses of seafood we couldn’t finish. A platter of assorted seafood, including shrimp, sea snails, and something that we think was some kind of bloom clam or oyster. It was interesting. 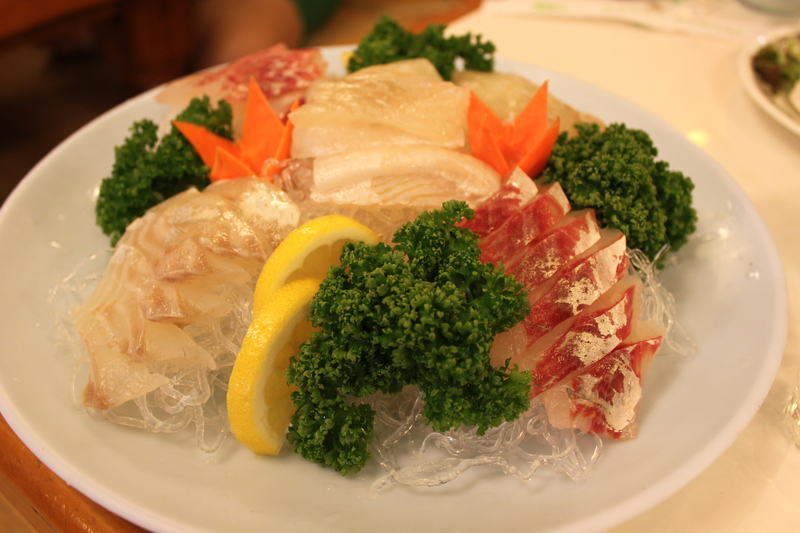 A platter of fresh sashimi. 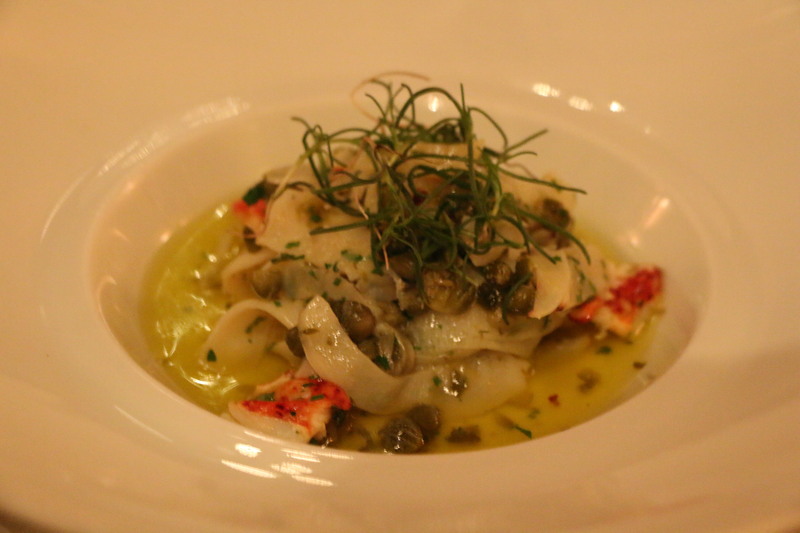 The platter was divided by different parts of the fish, which had vastly different textures. Let the food photos speak for themselves. 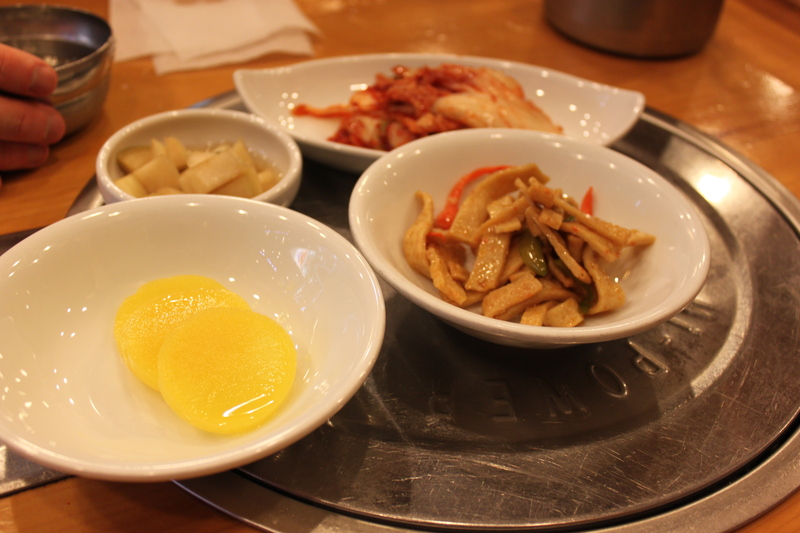 Some BanChan – the smorgasbord of complimentary appetizers that appear before or along with a Korean meal. 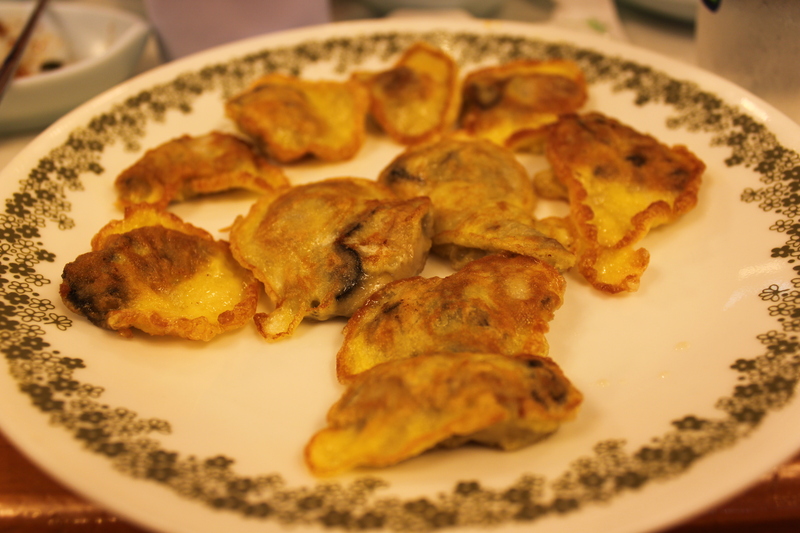 Kimchi Dumplings at Sinpo Woori Mandoo House. 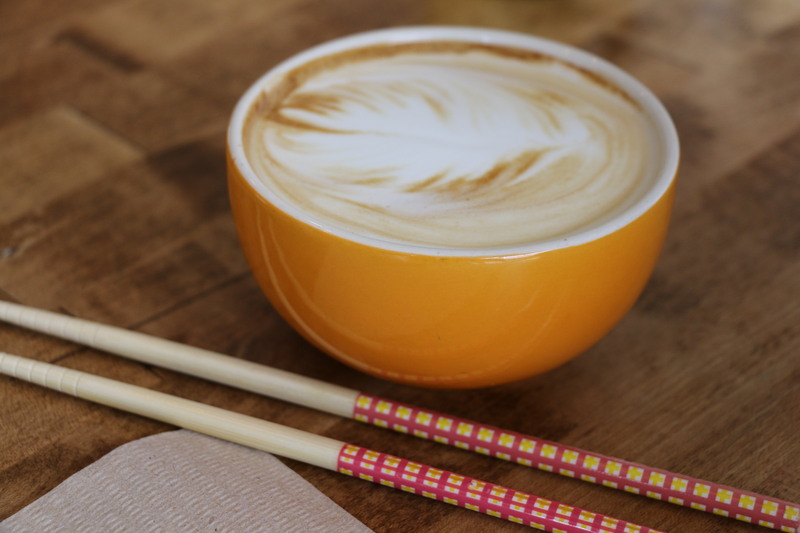 Sikhye – sweet Korean rice drink. 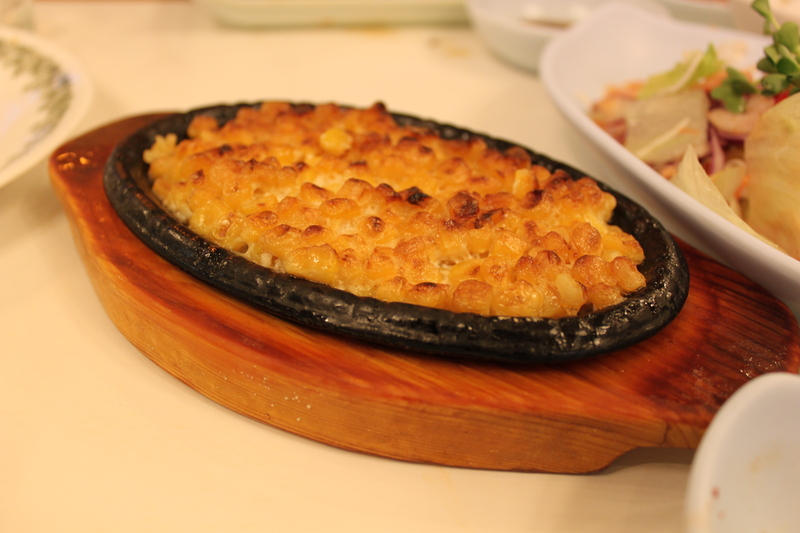 Hottoek – fried rice cake with brown sugar in the middle. 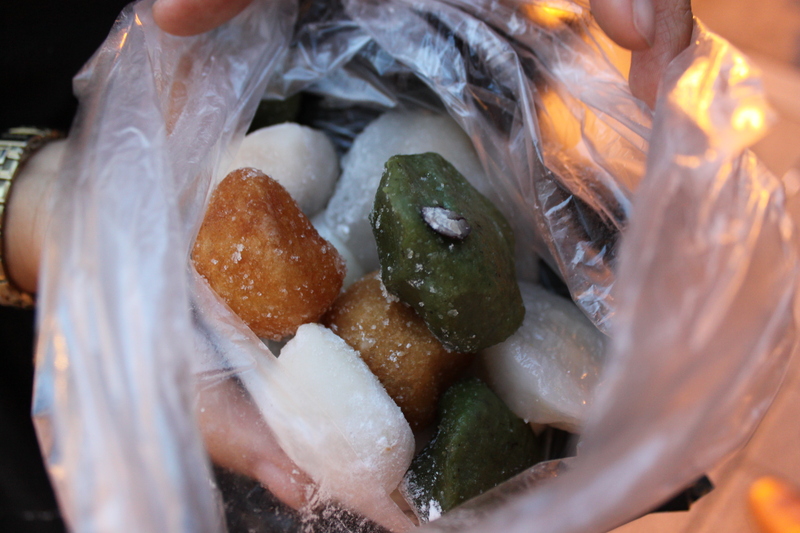 Dok – an assorted variety of rice cakes. 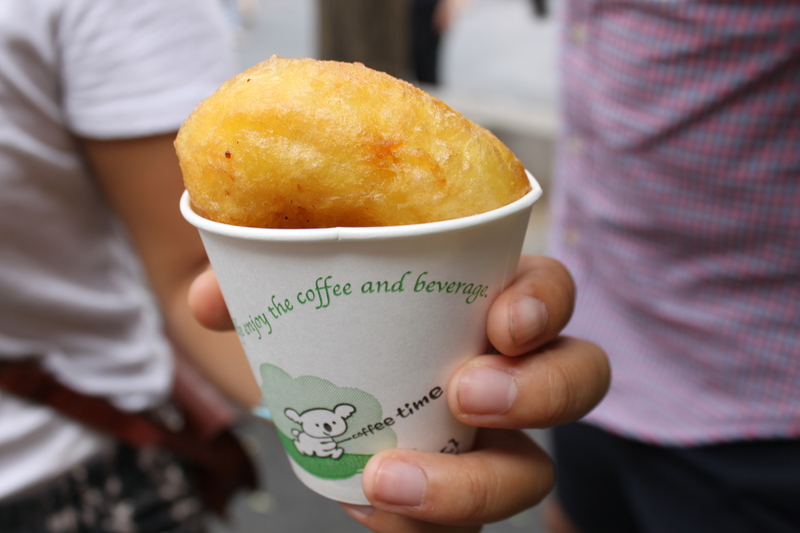 The best were the fried ones, like an asian version of the donut hole. Milk Bread at Tous Les Jours. There are Tous Les Jours bakeries all over Asia, and I decided to finally try one in Korea, where the chain originally started. 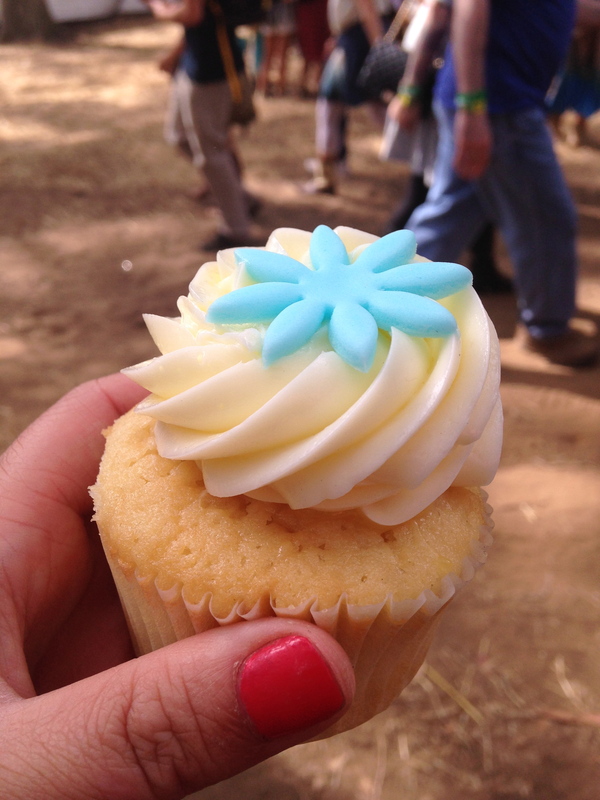 The baked goods are surprisingly terrific. The textures and flavors are on-spot. This bread was delightfully light and fluffy, with just a hint of sweetness. Iced Mango Dessert per my sister’s request. The idea of cold soup seems oxymoronic to me. Gazpachos aren’t my preferred dish. But sometimes, a cold soup can be the perfect remedy to a hot day. My sister has no problem with cold soup. One of her favorite Korean dishes is Naengmyeon, a cold noodle soup originally from North Korea, but with a large presence in the South. On our recent trip to Seoul, she was insistent that we get some. 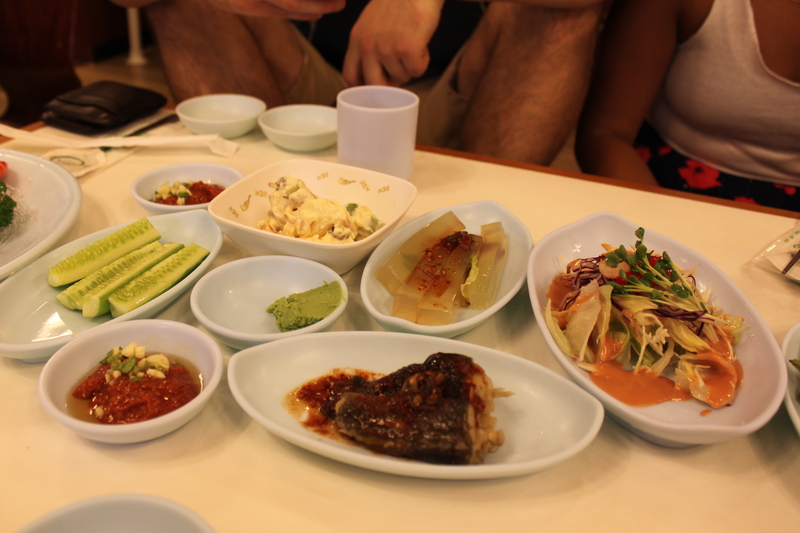 I found this place off of Daniel Gray’s Discovering Korea and it was a huge hit. We went after a long tour at Gyeongbukgong Palace. The restaurant was across from the palace wall, but a bit hard to find considering how long the palace wall is. I asked three different policemen to point us in the right direction. Each time, they knew exactly where I was talking about. I took this to be a good sign. My sister and her friend Cleaves were both impressed by my find. The restaurant was extremely authentic and the Naengmyeon was the best I’ve ever had. This Naengmyeon has made me a cold soup convert. To give you a sense for the authenticity, we walked in to find a small room filled with six tables of Koreans. A pile of shoes greets you at the front door. When we walked in the door, every person in the room stared at us. This Naengmyeon was exactly the right temperature. Cold, but not cold enough to give you a brain freeze. To provide the right temperature, the soup has large chunks of ice in it. The buckwheat Naengmyeon noodles are not apparent in this photo (they are underneath the broth), but were deliciously light. The broth was extremely flavorful.